With the summer season now at an end and we are into September customers are starting to think about buying their Christmas presents. Although our range of toys seem to be for children we do have a lovely selection of collectable tin toys for the more 'mature' person in your life whether they are 16 or 60 and if you are looking for something different then do check these out. 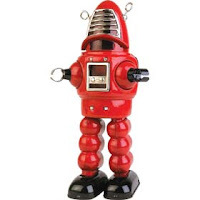 One of the most popular sellers has to be the Sparking Space Robot or as he is better known, Robbie Robot an d Planet Robot. Just wind him up and he wobbles around whilst sparks fly in his visor. 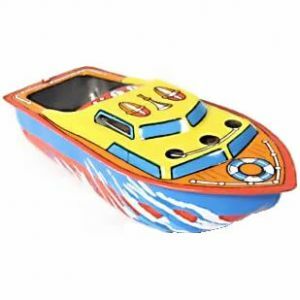 Everyone probably remembers the pop pop tin boat and I have even had a customer on holiday from London unable to find one and couldn't believe his luck when I had one here in the shop. Candles are lit and inserted into the boat and it propels itself along the water. 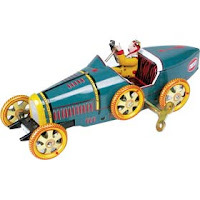 For the car lover there is the Bugatti and the Vintage Racing Car, both sturdily made in tin with long running motors, and a little man sat in them for a realistic look. A perfect pres ent for any racing car enthusiast. Another highly amusing and frustrating toy is the Tin Basketball player . 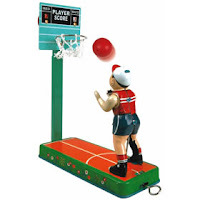 Although not a wind up toy it has a spring action where a ball is placed in his hands and the lever pulled and released to flick the ball into the basket, if you are lucky! So if you are looking for presents for the Grandchildren or for Grandparents then we hope we will have something for you.